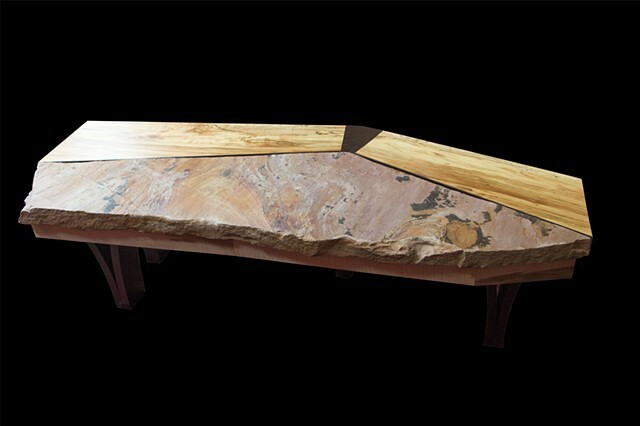 W 66.5" D 27" H 18"
This coffee table was designed around an irregularly shaped piece of sandstone colored slate about 2" thick. The client wished to also include wood as part of the top of the table and a beautiful,colorful slab of spalted maple was chosen. A wenge "keystone" and wenge accent strip between the slate and spalted maple serve to accentuate the lively colors and patterns in the two media. The stone and spalted maple rest upon a torsion box table that has curly maple edging. Four legs are attached to the torsion box and each leg is made from a curved,laminated structure that is covered with wenge veneer.